[These photos are from Serge Klarsfeld's “Auschwitz Album” where Photo 19 is numbered 128 and Photo 20 is 141 [or 145, the two being identical except for the amount of background shown.141 has been chosen here precisely for the depth of background. 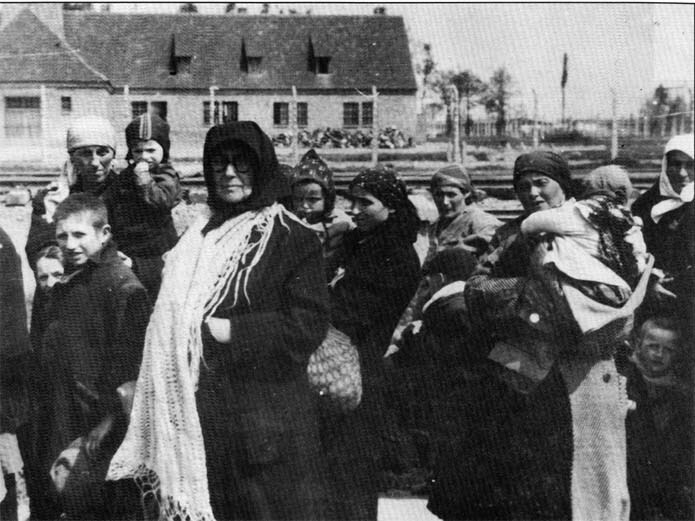 The two pictures, classified under the heading “Nicht mehr einsatzfähige Frauen u. Kinder / Women and children not capable of being employed”, were taken one after the other, fixing the two groups between Krematorien II and III ( the eastern part of the latter being visible on Photo 19), the SS photographer having his back to the south, a few meters away from the barbed wire fence surrounding Krematorium II, the gate to which is on the left. To show the true locations of the two prints with respect to their backgrounds, they should have a space of about 15 cm between them. These are the last pictures taken of people about to enter Krematorium II. The photographer did not take pictures in the Krematorium grounds or inside the building itself. His visual report was concerned with those about to be exterminated, not the technique employed, which was known to all the SS. Given this gap in the photographic evidence (whatever the reason for it) Robert Faurisson explains that these people are simply “passing by” on their way to the Zentral Sauna to be medically examined, shorn, deloused and showered, before being integrated into the camp or transferred “elsewhere”. He thus implies that their presence between the two Krematorien is simply a consequence of the route taken, and is thus perfectly normal if not commonplace. 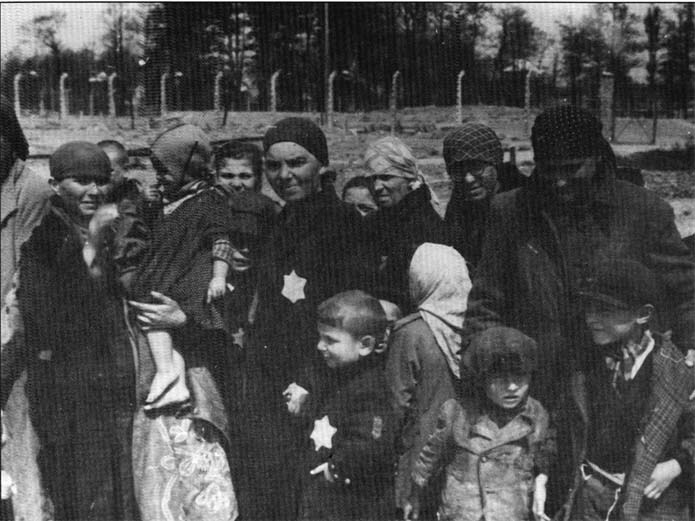 Admittedly, on many “Auschwitz Album” photographs, the SS photographer made people stop and sometimes turn completely round for the sake of the picture, but frequently one or more of the group did not obey (through fatigue, incomprehension, or deliberately) and remained facing where they were going when the photo was taken. In the “Auschwitz Album”, photo 142, taken before the two presented here, shows women and children walking, not on the “Hauptstaße / Main road”, but leaving it to go off at an angle towards the grounds of Krematorium II. The women and children in Photo 19  are not “passing by”, they are stopped, their bodies facing west and their heads turned to the south, to watch the photographer. Those on Photo 20  have their bodies almost facing the entrance to Krematorium II, situated in the extension of the path leading from the gate of Krematorium III (visible in the right hand background). They too have their heads turned to watch the photographer. The some 35 women and their children on these two photographs have only about two hours to live.